A lodranite found at Graves Nunataks, Antarctica. Dimensions: 10.5 x 8 x 5 cm. 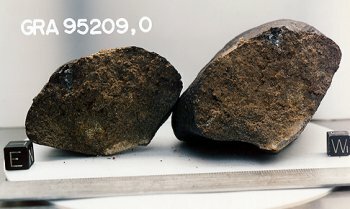 Mass: 949 g. The section shows an equigranular aggregate (grains averaging 0.3 mm) of equal amounts of nickel-iron, olivine, and pyroxene, with a little plagioclase. Image and description: Johnson Space Center. Lodranite is a rare type of achondrite named after the 1-kilogram Lodran meteorite that fell in Punjab, Pakistan (29° 32' N, 71° 48' E) on October 1,1868. To begin with, lodranites were considered to be stony-iron meteorites because they contain stony components, notably olivine, orthopyroxene, and minor plagioclase, and nickel-iron alloy in roughly equal proportions. However, since the discovery of the closely-related acapulcoite group, the lodranites have been classified as primitive achondrites. The similar mineralogy and oxygen isotope compositions of these two groups indicate they may have originated on the same parent body, most likely an S-type asteroid. Lodranites contain bigger crystals of olivine and pyroxene and appear to have been subjected to greater heat than acapulcoites. This suggests they came from deeper inside the parent body where they underwent more intense thermal processing and a subsequent longer period of cooling.